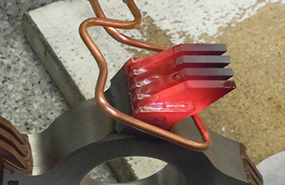 For more than 30 years CEIA has been working on the design and manufacture of no-contact Induction Heating Devices for metal treatment. High and medium-frequency generators, control units, optical sensors for measuring temperature and automatic solder-alloy wire supply devices make up the line of products known as the Power Cube Family, which are ideal for industrial processes of heat treatment and braze welding. 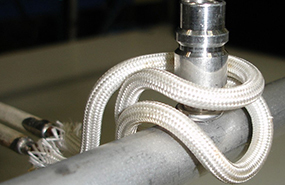 The high performance they offer contributes to the widespread use of CEIA systems in the most important industrial fields, where they have received the approval of end users and final-product manufacturers. 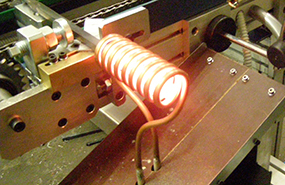 Our induction heating systems are currently applied in different industries. Thanks to the extremely high energy efficiency, guaranteed reliability in time and reduced overall size, Ceia Induction Generators, Control Units and Optical Pyrometers are complemented by all the main automatic machine manufacturers (OEM), and have been used successfully in all those applications where the process repeatability, the constant power supply, and the accurate temperature control are essential. CEIA generators are particularly suitable for all solder-brazing applications of steel, copper, inox, aluminium items and other metallic alloys. 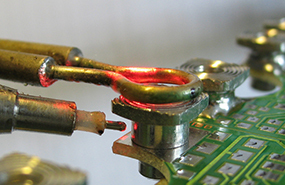 Specialized control units can manage all the soldering working phases and accomplish a closed-loop control system that allows all the soldering parameters set by the operator to be respected. CEIA devices, thanks to the power output and to the extremely accurate temperature control, allow the heating to be limited to the soldering area only, thus safeguarding the metallurgical properties of the hard metal and cutting tip. 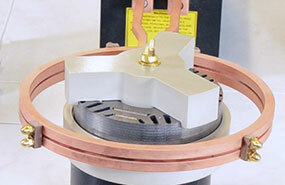 CEIA generators perfectly adapt to hardening applications, surfacing hardening, annealing. The area and the heating depth depend in fact on the coil geometry and on the exposure time to the magnetic field. 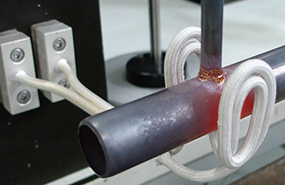 The aluminum brazing applications are particularly critical because the melting temperature of the brazing alloy is quite close to the melting temperature of the aluminum itself. 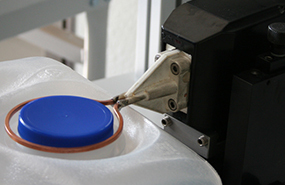 High frequency devices, series 900, therefore, are extremely suitable for cap-sealing applications, where the speed, precision and repeatability of the heating are basic peculiarities. CEIA Induction Generators, thanks to the extremely compact dimensions, can be easily integrated inside Forging Machines, for processes of Warm Forming (300-900°C) of an alloy of Titanium, Nickel, Steel, for the production of fasteners. 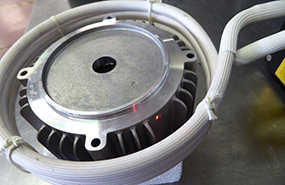 With a wide range of frequency and power, CEIA generators achieve excellent performances and very high yields of both magnetic and non-magnetic materials (Titanium alloy, Nickel, Steel). Curing involves any process where heat is used to catalyze or initiate chemical and molecular level structural changes in a polymeric materials such as epoxies, phenolics, polyesters and silicones. These materials are applied in many ways to various products for bonding, protective coating, sealing, insulation and other uses. 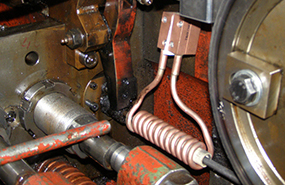 It is a common technique in industries and mechanical workshops for assembly and disassembly of mechanical components and transmission units. This method involves the use of heat and thermal expansion phenomenon to overcome the dimensional interference of two components and create an extremely strong mechanical coupling between two parts.